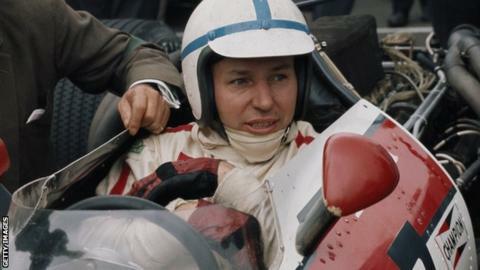 Former Formula 1 and motorcycling world champion John Surtees has died at the age of 83. Surtees is the only man to have won the grand prix world championship on both two wheels and four. He won four 500cc motorcycling titles - in 1956, 1958, 1959 and 1960 - and the F1 crown with Ferrari in 1964. Surtees died at St George's Hospital, London, on Friday afternoon after being treated for an existing respiratory condition, a family statement said. "We deeply mourn the loss of such an incredible, kind and loving man as well as celebrate his amazing life," the statement added. Legendary F1 commentator Murray Walker told Radio 5 live: "It's an absolute hammer blow for me and for British motorsport in general. "I have been privileged to commentate on him and to know him as a friend and he's undoubtedly one of the greatest people who's ever lived in the history of motorsport." Surtees was awarded an MBE in 1959, the same year he won the Sports Personality of the Year award, the OBE in 2009 and the CBE in 2016. He won six F1 races in 111 starts between 1960 and 1972, and also drove for Honda, Lotus, Cooper, Lola and BRM. Surtees was world champion in the 350cc motorcycling category as well as 500cc from 1958-60. He later set up his own F1 team and was behind the wheel when it made its debut at the 1970 British Grand Prix at Brands Hatch. Team Surtees managed two podium finishes but never won a race before folding in 1978. Surtees went on to become chairman of the British team in the now-defunct A1 Grand Prix series, while his son Henry began competing in Formula Two but was killed in an accident at Brands Hatch in 2009, aged 18. The family set up the Henry Surtees Foundation in aid of people recovering from brain and physical injuries and to support motorsport-related educational programmes. Surtees remained involved in motor racing into his eighties, competing in classic car and bike events up until last year.